I am not sure how many people are aware that there is a day dedicated just for S’mores. August 10 is considered national s’mores day. A favorite treat that you will find most campers eating. S’mores chocolaty crunchy treats date way back to the 1920’s. Many believe that the girl scouts were the first to come up with this treat, however it is said that they were first created by the campfire girls. Campfire girls now called Camp Fire USA was a youth organization started back in 1910 which had camping and outdoor activities for just girls. The girl scouts quickly took over this camp side tradition. I always wondered how they came up with such a name. It is said that once these got popular everyone would ask for “ some more” hence the name S’mores. Not only are the fun to eat, but they are easy to make with a few simple ingredients. If you can toast a marshmallow you can make S’ mores. Here is the traditional way of making them. •	Then place a half of Hershey bar on one half – if you are a chocolate lover put another Hershey bar half on the other cracker. For those who really want their chocolate to be melted you can also assemble your S’mores, wrapped them in foil and place the foil pack on the grates of the grill. Your chocolate will definitely be oozing. Caution making them this way they get very hot. If you try this method just be careful not to burn your treat, your fingers or your mouth. If you get a craving for your favorite camp side treat in the middle of winter no problem . You can also make them in the microwave or oven. Kraft came out with a new marshmallow specially for making S’mores. They are a flatter marshmallow that works get for S’mores. We tried these this year, however they are very hard to toast . 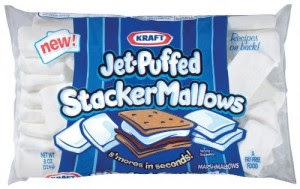 Personally for making them over the campfire or grill I would recommend using the regular marshmallows, but if you are making them in the oven or microwave these would be perfect. We hope everyone will celebrate today by making S’mores. Sit back, relax and enjoy the sweet gooey chocolate treat. Post your favorite S'mores story and be entered in a drawing to win the makings for S'mores. One winner will be pick randomly. We will supply the ingredients all you need to supply is the fire. Enter today through 8/15/11 for a chance to win.